1. Heat the oil in a flameproof casserole or heavy-based saucepan. Season the steak with salt and pepper and add to the hot oil. Fry for 5 minutes, turning until browned on all sides. Using a slotted spoon, transfer to a plate. 2. 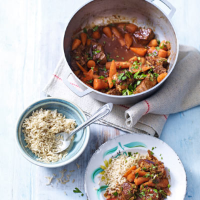 Add the onion, garlic, chilli and carrots to the casserole and cook over a gentle heat for 6–8 minutes, stirring often. Stir in the cinnamon and cook for another minute. Stir in the tomato purée and 300ml boiling water and mix well. Cover and simmer for 10–15 minutes, until the carrots are tender but still retain some firmness. 3. Return the steak to the pan and gently warm through for 2 minutes. Scatter over the mint and serve with rice. Sirloin steak is wonderfully tender in this quick-cook summer stew. If you prefer a more economical cut of meat, frying steak is a great alternative.